Photos Courtesy of Aquatic Ecosystems, Inc.
Biofilters require a steady diet of ammonia. This is ordinarily not a problem, as fish produce about the same amount daily if they are fed. As the fish grow and the ration is increased, the bacterial colony increases. The problem occurs when fish are harvested and the colony is either killed in disinfection or atrophies in the absence of ammonia and then new fish are stocked. When fish are introduced into a "clean" system, it typically takes over a month for the biofilter to reach a steady state capacity. In the interim, spikes of ammonia and then nitrite occur that can kill fish. The first spike of ammonia occurs immediately because there are no nitrification bacteria of any sort. Once the ammonia oxidizers begin to grow, the ammonia declines but nitrite spikes. Finally the nitrite oxidizers become established. The aquaculturist must address this difficult period by loading the system slowly. One way is to slowly introduce the fish a few at a time, another is to stock small ones. In either case, feed them sparingly, increasing the feed slowly over several weeks. Fasting fish produce little ammonia, but ammonia increases rapidly about one to two hours after feeding, as the fish metabolize their meal. Nitrification bacteria are ubiquitous in the environment and, in the presence of the four requirements, they will eventually colonize the biofilter. This colonization can be sped up a bit if a "seeding" of bacterial slime is introduced from another tank. Caution must be exercised not to introduce pathogens. Commercial products that purportedly contain living nitrifiers are available, as well. The media takes different forms from fiberglass plates, to plastic things that look like hair curlers, to sand. I once saw a functioning biofilter that used plastic toy soldiers! What ever form, it must be inert, that is, non-reactive with water and bacteria. It also must have the right degree of surface complexity. The smaller and more convoluted the media, the greater amount of surface area that can be packed into a small volume. This is good...up to a point. If the surface of the media has too fine a texture or the pieces are too small, the crevices will soon fill with bacteria and the filter will clog. 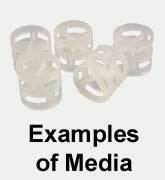 The degree of surface area that a media has is defined as specific surface area. This is the surface area of the media contained in a given volume of the media usually expressed as ft3/ft2 or m3/m2. If specific surface area is below 100, then the media is too large and open and a larger quantity of it will be needed for sufficient nitrification, but if it is over 300, it will clog. All biofilter medias should fall in this range. The exception is sand in a suspended bed filter which can have a specific surface area of 2000! How this is possible is explained in the next chapter. Of the four requirements of nitrification, fish supply the ammonia, of course, and the aquaculturist monitors pH and adds sodium bicarbonate as necessary. The design of the biofilter provides the surface area for colonization and it may help supply the oxygen, as well. Biofilters must also be self-cleaning, that is they must not clog as the bacteria proliferate. Surface area is created in all biofilters with inert media. As for oxygen, there are two classes of biofilter. One has a design that promotes the diffusion of oxygen from the air. Rotating biological contactors (RBC's) and trickle filters fall into this group. These elevate the wet media into the air in some way so the vast surface area for bacteria is also used for diffusion of oxygen. In the other group, the media stays submerged and all oxygen for nitrification must come from the water, increasing the demand on the system's gas exchange mechanism. Bead filters and suspended bed filters are examples. Obviously, there is an inherent advantage to a design that supplies its own oxygen. While bacteria that convert NH3 to NO2 (Nitrosamonas) are obligate aerobes, bacteria that convert NO2 to NO3 (Nitribacter) are facultative anaerobes, and the bacteria that convert NO3 to N2 (anaerobic heterotrophs) are obligate anaerobes. Therefore, biofilters that tend to be hypoxic and have anaerobic areas, such as bead filters, are not efficient in the first stage of nitrification, but may support the second stage of nitrification very well and are necessary for denitrification. The oxygen and water rich in fish waste that stimulates the nitrifiers, also stimulates general decomposer bacteria, aerobic heterotrophs. A build up of aerobic heterotrophs on a biofilter can reduce nitrification by competing with the nitrifying bacteria for space and oxygen. The aquaculturist can discourage aerobic heterotrophs by decreasing their food. This is accomplished by improving solids removal, trapping smaller particles, using foam fractionation or ozonation, etc.